Books and Quilts: Needlework Tuesday - I don't need any more project ideas! 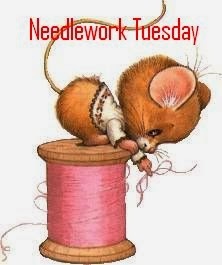 Needlework Tuesday - I don't need any more project ideas! I've been trying really hard to stick to the three projects that I talked about last week. Honestly, I don't need any more new ones to work on. I did add some more buttons to the maple leaf wall hanging. In the upper left areas, you can see some clustering starting to happen. At this stage there are 65 buttons attached. I am having fun with this; I could easily devote my entire week of stitching to just this one project. In all practicality, that would never happen, I would need to see some progress on the other items laying around. After finishing the knitting of the second hand towel, I still had oodles of this cotton left, so started what the pattern calls a dish cloth. eeks, too pretty a design and too thick for a dish cloth. It would never dry before it rotted away or became stinky. I know it will make a wonderful hot pad for the table. The pieces are now ready for assembly. Even after I finished 2 hand towels and 2 hot pads, I'll still have an abundance of these cottons. I bought them last year at the tent sale at Spinrite yarns in Listowel. It was too cheap not to buy knowing how much the small balls cost in the regular stores. Do you have a favourite pattern that calls for cotton yarn that isn't clothing? Please share the link. I didn't work on the fittens, project 3. I didn't knit on my sister's socks, project 4. Oh, I love the feathers! I may have to take up crochet just to make them! Love those feathers!!! Not sure what you'd do with them afterwards, but they are beautiful. I don't have any tried and true patterns for cotton, but I did a quick search for "What to knit with cotton yarn" and came up with a nice bag, called Eastern Market Tote. Not a dishcloth, not clothing. The pattern is free from Craftsy. The pattern itself calls for silk, so I'm not sure why it came up with that search, but it's a thought. Love your Canada Leaf, beautiful. Can't wait to see this put together. Those leaves are really pretty. Thanks for sharing the video. Have a great day!